Figure 6.13. Death of one twin at 19 weeks led to the formation of a fetus papyraceous in this term pregnancy. Morphology was adequately preserved to permit the histologic confirmation of the dividing membranes as monochorionic. While the etiology of the death of the infant is not fully determinable at this time, transfusion syndrome is likely. The surviving twin was at increased risk for vascular disruptive anomalies, but was uninvolved. The risk for disruption seems to become greater as the gestational age at fetal death increases. occur around the time of death and cause damage at that time from anemia and hypovolemia. The incidence of disruptions in the survivor does not seem to increase with long duration of the pregnancy after the demise. 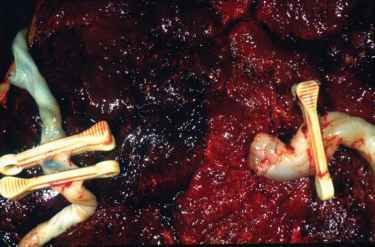 A small portion of monochorionic twin placentas entail relatively late splits in the conceptus. Monoamniotic pregnancies are usually diagnosed prenatally by ultrasound. Numerous large anastomoses typically occur in such placentas, and chronic transfusion syndrome is rarely a problem. Cord entanglement leads to very high morbidity and mortality. 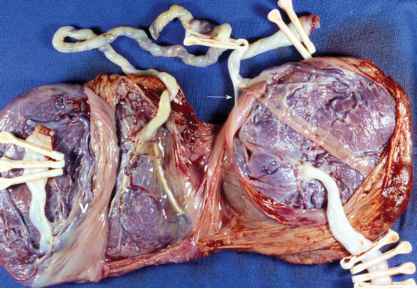 A monoamniotic state should only be diagnosed if there is a layer of amnion covering the fetal surface between the cords (Figure 6.14). Most monochorionic twin placentas which apparently lack dividing membranes are actually disrupted diamniotic monochorionic placentas. 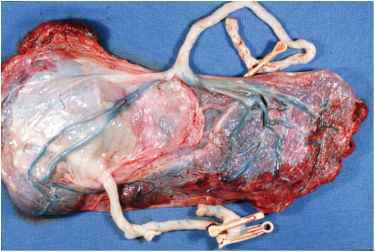 A particular form of vascular anastomoses in a monochorionic placenta permits the development of acardiac twins. Such fetuses are passively perfused by their co-twin and lack cardiac development from the circulatory reversal. External and internal development is strikingly abnormal (Figure 6.15). Occasionally placentas are found which show intermediate forms between the classic configurations (Figure 6.16). Figure 6.14. 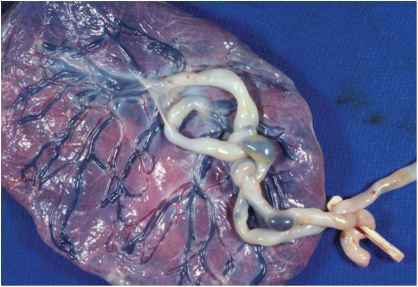 This monoamniotic placenta shows a common finding in such twins-entanglement of the cords with knotting. Mortality is said to be 50% in monoamniotic twins. Much of this cord-associated mortality occurs early in gestation. Limitation of space in the uterus helps prevent the necessary tightening after 30 weeks. 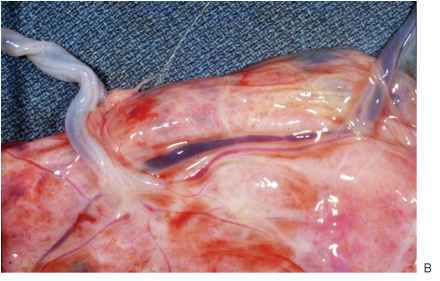 Large vascular anastomoses are usually present in monoamniotic placentas and chronic transfusion syndrome is uncommon. These infants had no apparent problems and were delivered near term. Figure 6.15. Another complication of monochorionic gestations is the formation of "acardiac twins." These are incompletely developed and may lack a heart and other vital organs. 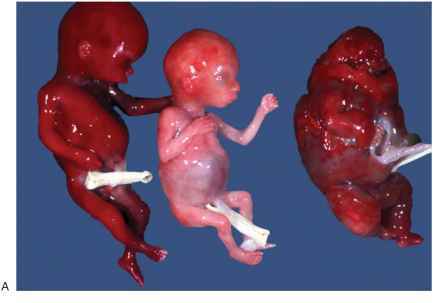 (A) In this set of monochorionic triplets, the small pale fetus (middle) was the donor to the larger normally formed plethoric twin as well as the pump twin for the acardiac. Figure 6.15. (B) Single artery to artery and vein to vein anastomoses which were associated with the acardiac. These permit reversed circulation to occur through one twin leading to its abnormal development. Figure 6.16. The dividing membrane is incomplete in this diamnionic monochorionic placenta. It is absent near 3 o'clock. This is an amniotic "plica." The origin of these is not always clear. Split of this conceptus may have occurred slightly earlier than in a true monoamniotic placenta, leading to partial formation of the amnion. It has also been suggested that rupture of the amnion in a diamnionic monochorionic placenta could lead to this configuration. Such transition stages are uncommon. (Reproduced with permission from Gilbert WM, Davis SE, Kaplan C, et al: Morbidity associated with prenatal disruption of the dividing membrane in twin gestations. Obstet Gynecol 1991;78:623-630). Figure 6.17. There is a slight difference in color on the maternal surface between the areas belonging to each twin.This is often due to differences in blood volume in the two sectors. While this may indicate transfusion between monochorionic twins, it is often seen in dichorionic twins due to differences in time to cord clamping, height of the infant after delivery or draining of blood from the placenta. Figure 6.18. Cord abnormalities are very common in multiple gestations, and may contribute to asymmetric infants. A complex velamentous cord insertion is present here. The vessels of one cord traverse the dividing membranes to pla-cental tissue on the opposite side of the other disk. Vessels within the dividing membranes only occur in dichorionic placentas. Dividing membrane insertions seem particularly prone to problems including compression and thrombosis. can be associated with growth retardation (Figure 6.19). This is generally due to limitations of uterine space for placentation. Abnormal outlines and succenturiate lobes are frequent. 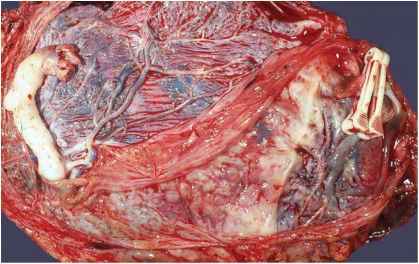 Other pathologic processes such as pre-eclampsia or membrane rupture may differentially affect the two placentas (Figure 6.20). Figure 6.19. 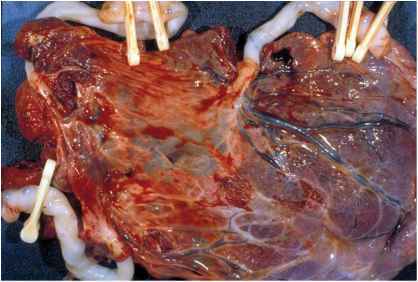 This dichorionic placenta (note prominent ridge) shows a marked difference between the sizes of the two placental portions. The smaller placenta was associated with a severely growth-retarded infant. Such discrepancies may be due to unequal placentation caused by problems of space in the uterus or by a process affecting only one infant (e.g., chromosomal aneuploidy, vascular disease). Similar inequalities occur in monochorionic twins as well. Figure 6.20. Amnion nodosum is present on the surface of one twin (arrows). 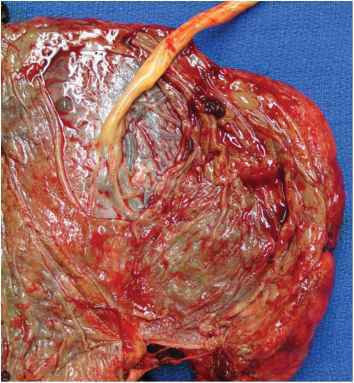 There was prolonged rupture of the membranes in one sac of this dichorionic placenta. 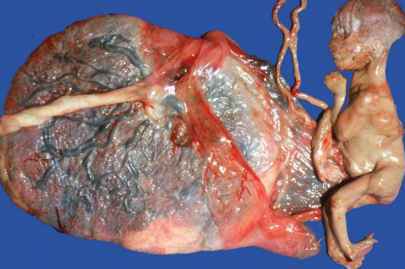 There are extensive unruptured velamentous vessels. When examining the placentas of higher multiple births the same basic concepts used in twins apply. 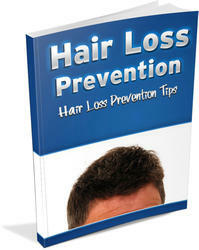 The steps of examining the dividing membranes and making rolls will need to be done several times, once for each pair. These placentas are often quite disrupted (Figure 6.21) and other abnormalities are frequently seen (Figure 6.22). Although this triplet placenta is rather disrupted, one can still identify that this is a monochorionic set. There is one continuous chorionic plate with three cords. Even disrupted placentas should be carefully examined as there is often much that can still be identified about their gross morphology. Figure 6.22. 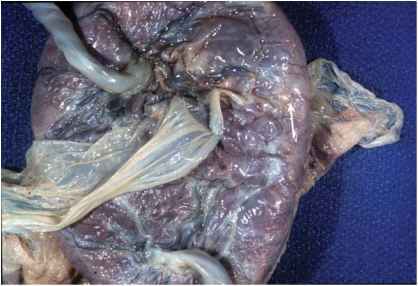 This is from a trichorionic quadruplet pregnancy. There are two separate disks. One belongs to the dichorionic set of A and C and the other to the monochorionic set B and D. A shows a white surface vein thrombosis, B has a velamentous cord with a small web (arrow), and C's cord inserts velamentously into the dividing membranes (V). occur in both mono and multichorionic gestations, and chorionicity can usually be determined. Although some result from transfusion syndrome, other etiologies include anomalies, cord problems, and reductions of higher multiple births (Figure 6.23, Figure 6.24). Is there a dividing membrane on a separate twin placenta? Are monoambiotic twins development problems? Is membrain rupture more common in twins or single? What happens if one monoamniotic twin dies in uterus? Is it possible to have one momo twin with chromosomal damage and the other twin normal? 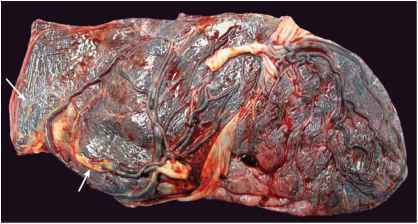 Is it abnormal for one twins cord to insert into placenta near dividing membrane? How to prevent twin cords knotting? Is membrane visible in monoamniotic mono chronic pregnancy?